Tired of dragging that old lawn sprinkler around every few days? Consider having an underground sprinkler system professionally installed by VB Landscaping! 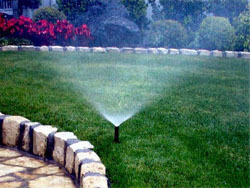 We are irrigation and sprinkler system specialists. We install, maintain, and repair complete irrigation and/or sprinkler systems. Once your system is in place, we program it to water your lawn on a regular schedule, and set the startup time and watering duration, so that you can enjoy your lawn without the hassle of taking care of it!